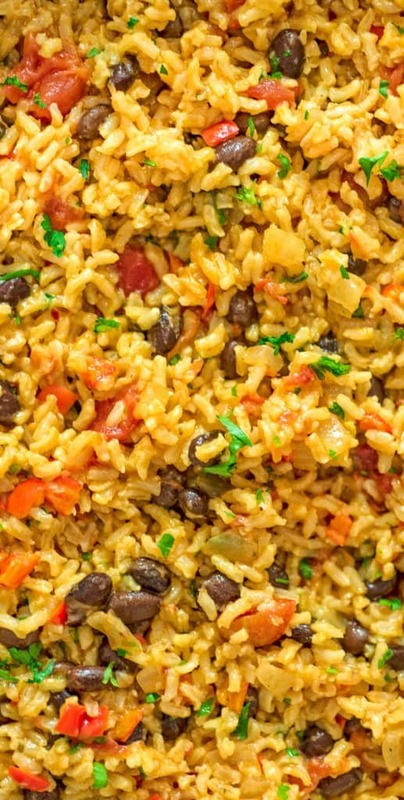 This is THE ONLY Rice and Beans recipe you’ll ever need! Made with simple ingredients, this dish is filling and very tasty. 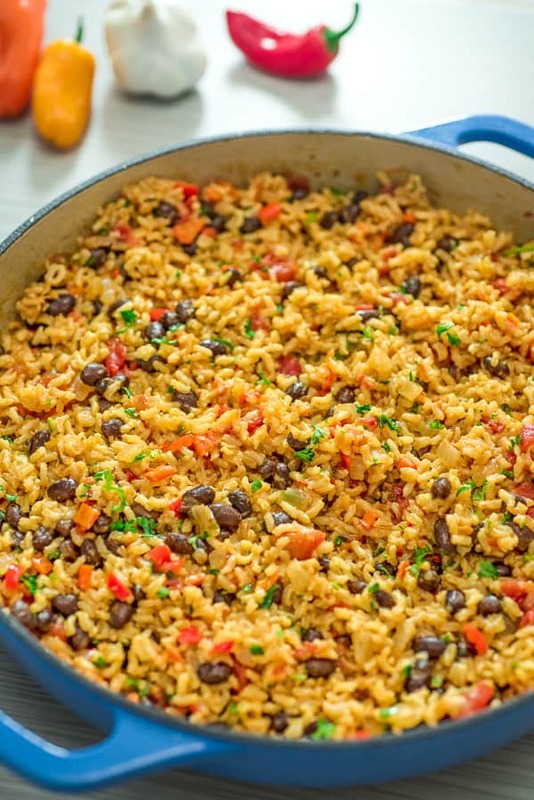 I’ve tried so many variations of Rice and Beans, and this one is definitely the winner! It makes an amazing side dish, or a satisfying meal. I honestly can’t wait for you to try it! 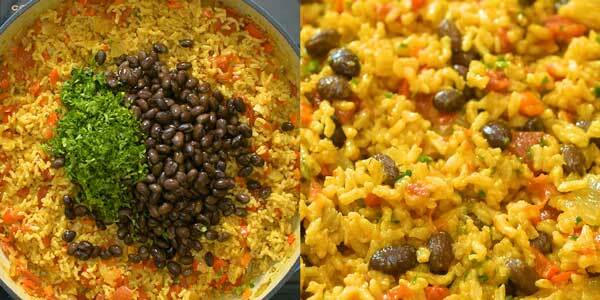 I make this hearty Rice and Beans on a weekly basis, and my heart tells me so will you. 🙂 Let’s not lose any time and get straight to the basics. 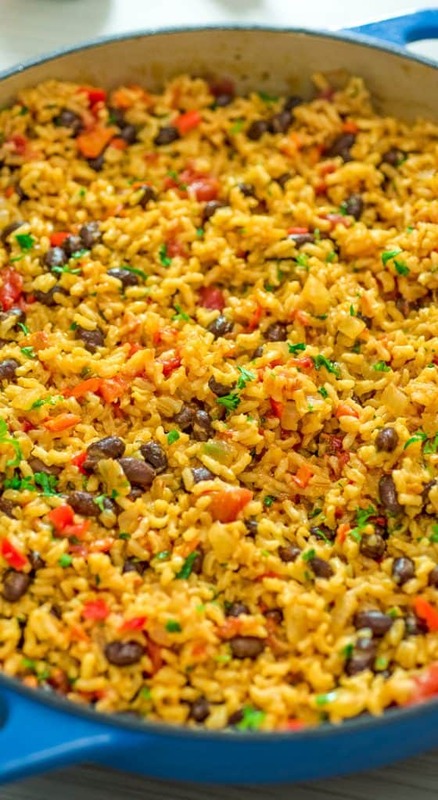 What kind of rice is best for Rice and Beans? It is best to use long grain white or brown rice in this recipe. I personally use Organic Brown Rice because I enjoy the flavor, and it is healthier as well. White Jasmine rice and Basmati would work really well, too. Whichever rice you choose, read the suggested cooking time and water-to-rice ratio, and adjust this recipe accordingly. I use organic black beans and I suggest you follow my lead. Kidney beans can also be used instead. You can buy canned beans or cook them yourself. If you buy canned black beans, don’t forget to rinse them before adding them to the pot. If you decide to cook the black beans yourself, follow these handy instructions: How To Cook Black Beans. Vegetable Broth. I use fully seasoned vegetable broth. If you use low-sodium broth or water instead, you may need to add some salt & pepper. Ground Cumin. This can be found in most grocery stores and online. Red Pepper Flakes. Adjust the quantity to suit your taste buds. Diced Tomatoes. I recommend using organic, canned diced tomatoes. 1. In a large, heavy-bottomed pot or skillet, sauté the onion in olive oil for about 3-5 minutes. Add the bell pepper and cook for another 3-4 minutes. 2. Add the garlic, cumin, and red pepper flakes. Cook for a minute. 3. Add the diced tomatoes and keep cooking, stirring occasionally for 5 minutes. 4. At this point, add the rice and veggie broth. Stir everything well and bring to a boil. 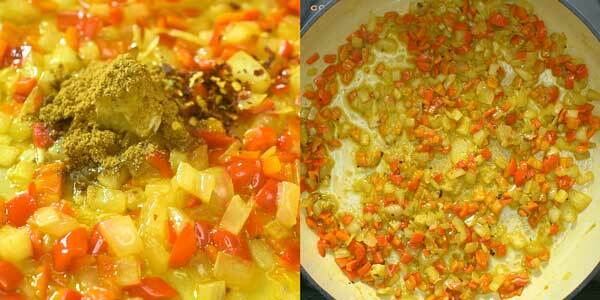 Cover with a tight lid, reduce the heat to low, and simmer for about 45 minutes,* or until the rice is cooked through. 5. Stir in the black beans and cilantro. Let it rest for 5 minutes. Serve. * Cooking time may vary depending on the kind of rice used. Follow the instructions on the rice package to get an accurate cooking time. 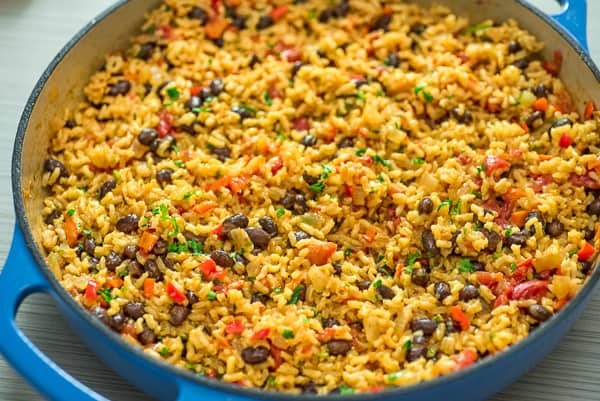 Is Rice and Beans Healthy? It depends on the ingredients used. If you use organic ingredients and brown rice instead of white, this dish will be a perfect fit in your healthy diet. 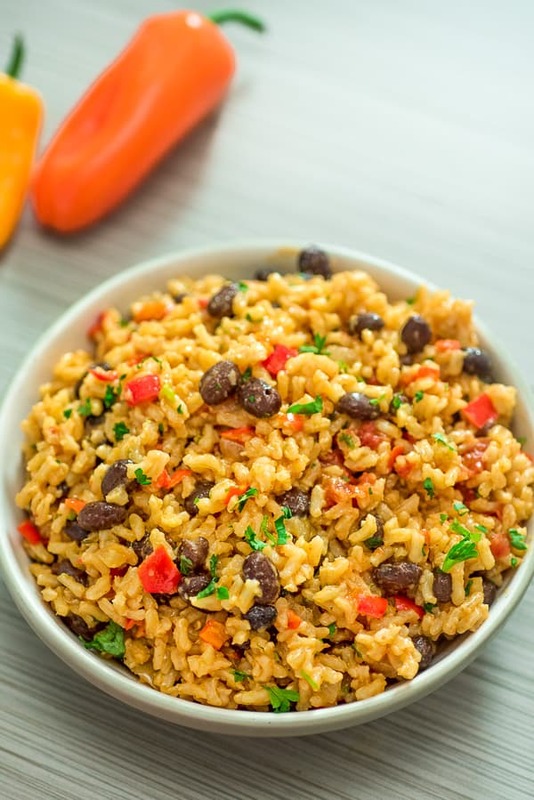 Is this Red Rice and Beans Recipe Vegan? Yes! This recipe is suitable for vegans. Can you Freeze Rice and Beans? Yes! It’s a good idea to freeze the rice in portions that you would normally use for one or two meals. I freeze my rice in in reusable plastic containers, to help reduce plastic waste. Ziplock bags work, too. 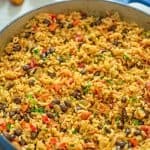 What to Serve with Rice and Beans? Skinny Cabbage Salad, Creamy Cucumber Salad. Easy Chicken Kebabs, Creamy Chicken Thighs. Grilled or Pan-Cooked Vegetables. Asparagus, zucchini, mushrooms, eggplants, etc. Try my Oven Roasted Vegetables, Zucchini Sauce, or Mushroom Sauce. I also love to enjoy it as it, simply topped with crumbled feta cheese. In a large, heavy-bottomed pot or skillet, sauté the onion in olive oil for about 3-5 minutes. 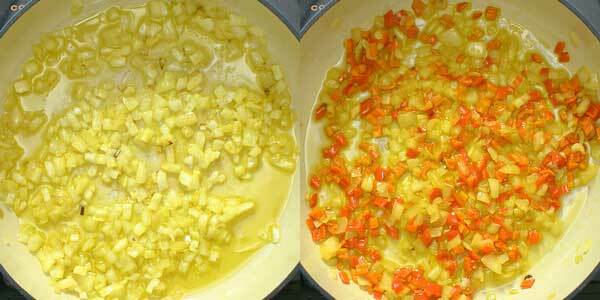 Add the bell pepper and cook for another 3-4 minutes. Add the garlic, cumin, and red pepper flakes. Cook for a minute. 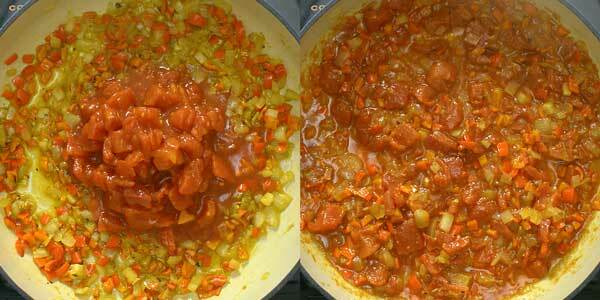 Add the diced tomatoes and keep cooking, stirring occasionally for 5 minutes. At this point, add the rice and veggie broth. Stir everything well and bring to a boil. 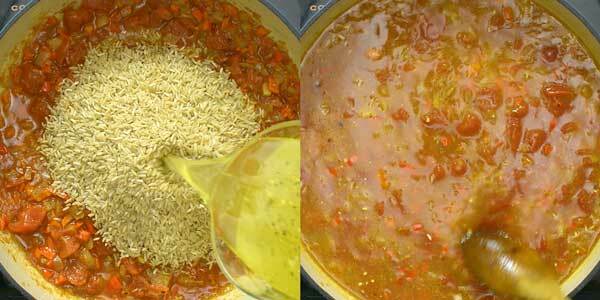 Cover with a tight lid, reduce the heat to low, and simmer for about 45 minutes,* or until the rice is cooked through. Stir in the black beans and cilantro. Let it rest for 5 minutes. Serve. Wow. I also make black beans and rice but this recipe seems very healthy n easy as well. I’ll definitely give it a try. Isn’t it Red Beans & Rice??? Hi Janice! No. The rice is red due to the diced tomatoes. The beans I used are black beans. No matter how you call it, it is DELICIOUS! Hope you’ll give it a try! This looks so good! 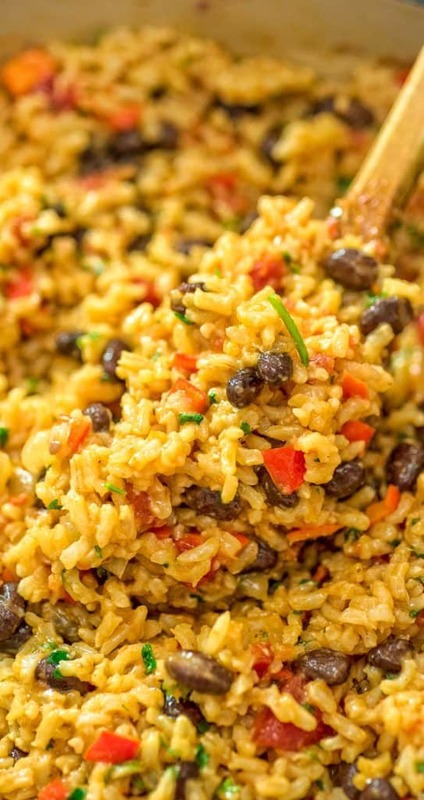 I adore rice and beans — and this has so many great flavors! Baaaaaybeehhh, this recipe was the bomb dot com!!!! Aaaaamaaazing!!! I give it 5 stars and putting this one in the ‘make again’ mix! Thank you! Thank you for such a sweet comment, Bee! Yummy. It is my new go to easy meal recipe. Everyone loved it. Thank you for such a amazing easy recipe. The first night I was in New Orleans we were served beans and rice (though certainly not as healthy as this!!) and I loved it. I didn’t think beans and rice together would be so tasty but it is definitely in all of those ingredients! Hi Roger! Brown rice holds shape well after freezing, so it shouldn’t be mushy when re-heated. Thanks! 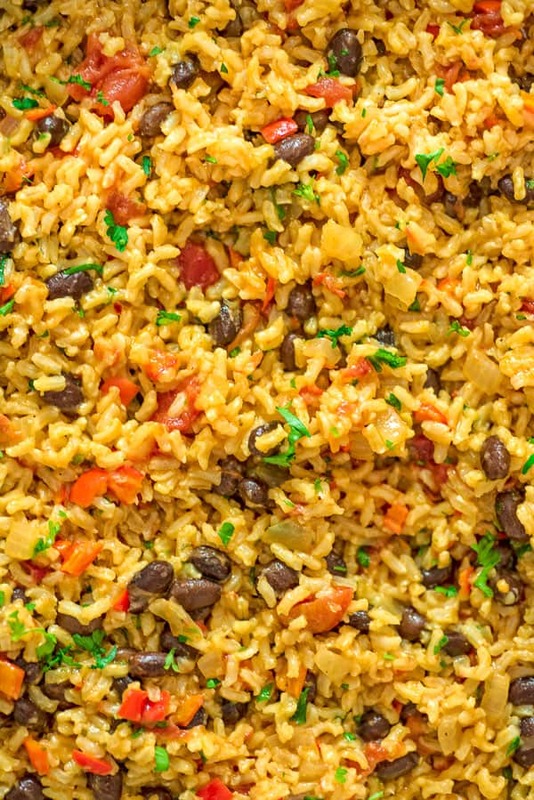 This is truly the best Rice and Beans recipe. I made it with brown rice also. Thank you so much, Jess! Glad you liked it!